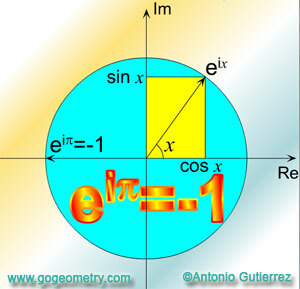 HTML5 Animation for iPad and Nexus: Euler's Formula e, Pi, i, 1, 0 One zero. Complex numbers, Taylor series. 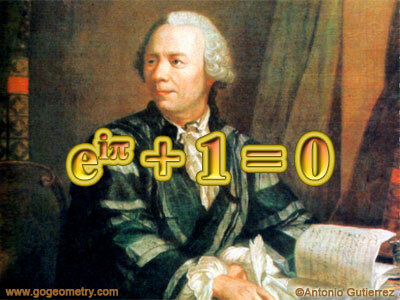 Leonhard Euler (Swiss mathematician and physicist, 1707-1783) and his beautiful and extraordinary formula that links the 5 fundamental constants in Mathematics, namely, e, the base of the natural logarithms, i, the square root of -1, Pi, the ratio of the circumference of a circle to its diameter, 1 and 0, together! Euler's formula is a mathematical formula in complex analysis that shows a deep relationship between the trigonometric functions and the complex exponential function. sin and cos are trigonometric functions. and we don't know what it means. and therefore we know it must be the truth." Reference: The Changing Shape of Geometry. Celebrating a Century of Geometry and Geometry Teaching. Edited on behalf of The Mathematical Association UK by Chris Pritchard. Cambridge University Press, (Cambridge 2003).